RIO DE JANEIRO, BRAZIL – Argentina is seeking greater partnership with Brazilian state-run energy company, Petrobras, to develop the country’s energy resources after announcing the nationalization of YPF, its main oil producer, last week. The move, which saw Argentine president, Cristina Fernandez de Kirchner, strip a 51 percent YPF stake from Spanish oil company Repsol and place the company under national control, sent shock waves through the business world. Argentina´s Planning Minister, Julio de Vido, met with the Minister of Energy, Lobao, photo by Elza Fiúza/ABr. Petrobras however, might be set to gain from the decision, reinforcing its position as Latin America’s leading energy company. Argentina’s planning minister, Julio de Vido, flew to Brasília on Friday, April 20th, to invite greater investment and partnership between the newly nationalized YPF and Petrobras. 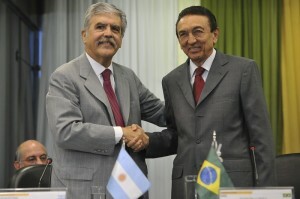 Vido’s arrival in Brasília was a meaningful move and demonstrated an urgency on the part of the Argentine government not to become isolated. Tensions with Brazil had been heightened in the past few weeks with the confiscation by local government of Petrobras’ production license in the province of Neuquen, western Argentina. However, Vido was quick to assure Petrobras on Friday that this could be resolved. Petrobras, which is now the world’s fourth largest energy company, has the resources and the know-how to replace Repsol in developing Argentina’s reserves. It is also a successful model of a state-run company, whose example many will be hoping Argentina follows. 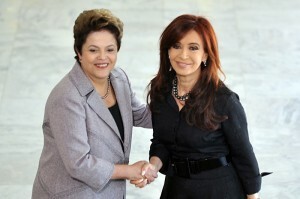 Presidents Rousseff and Kirchner during a August 2011 summit in Brasília, photo by Antonio Cruz/ABr. It is too early to predict how Argentina’s acquisition of YPF will turn out and Petrobras will be playing for time in order to get a better feel for developments. The international community has responded with outrage to the nationalization which many regard as tactics reminiscent of an old, radical and unstable Latin America. Kirchner’s dramatic decision was taken because falling oil production had reached a critical point, with the country forced to import oil and gas to meet growing demand. These energy imports are costly and destroy Argentina’s trade balance, which is vitally important for a country that is unable to borrow on the international bond market since defaulting on its debts in 2001. Kirchner blamed the need for imports, the first for seventeen years according to the President, on Repsol’s under-investment in the sector. However, the issue is not so simple, with Argentina de-incentivizing such investment by keeping oil prices in the country artificially low, cutting the margins for companies operating in the country and indirectly encouraging them to export. The risk of Kirchner’s move is increased by the fact that the country’s energy future arguably lies in shale oil and gas, with Argentina sitting on some of the world’s largest reserves. However, the development of this energy source is costly and complicated and Argentina will now struggle to attract the immense investment any project will demand. Petrobras has no real experience in shale gas and Argentina will likely have to look elsewhere for such expertise.